Hopefully, Jamie Foxx will say that he was not really serious about that. Truly those at BET are aware that Barack Obama is not our “lord and savior.” 24 of the 24 times (NKJV) the New Testament uses the term “savior” it is a direct reference to God and/or Jesus Christ. While in a sense Barack Obama is a political lord, combining that word with “savior” is inappropriate, and in my view blasphemous (the Bible combines the two terms for Jesus the Christ, see for example, Luke 2:11). 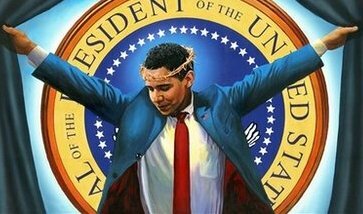 And, of course, Barack Obama is NOT some type of messiah (the above photo was put together several years ago and was popular for a time on internet; see Obama Crowned as Messiah?). Nor, as some at the other extreme believe, the final Antichrist. But, because of his timing, background, and policies, Barack Obama is apocalyptic and will help enable the rise of the King of the North and the King of the South, and hence the destruction of the United States. In his first news conference after re-election, President Obama said there was still time for a diplomatic solution on Iran’s nuclear program and that Iran could enjoy “peaceful nuclear power” if it meets international obligations. Diplomacy has failed and international sanctions, though having some effect, have not persuaded the radicals ruling Iran to stop their illicit nuclear program. The economic screws must be tightened. And while Mitt Romney may have been a tougher one for Iran to deal with, Iran is making a mistake if it feels that getting Barack Obama in office ultimately will be good for it. Believing that will be an error–the current government of Iran will change and/or be at least partially neutralized and Barack Obama may well play a part in that. Because we are near the end of times and Barack Hussein Obama is considered to be black and he is now the new “ruler in the West“ and he does lead the “strongest army on earth,“ it makes sense that certain Shi’ite Muslims believe that he may fit that Islamic prophecy. Apparently this prediction shows that some type of deal is made between the Mahdi (Arabic for “the guided one“) and the West. Is any of that specific to Barack Obama? The Shi’ite understanding of the Imam Mahdi is that he will support Iran and help Iran defeat the USA and takeover the world. Yet, since the “Imam Mahdi” has not made his public appearance (Iran has claimed he exists now in the background and orchestrated items like the ‘Arab Spring’), Iran’s President would probably prefer that Barack Obama be in office longer to give Iran more time to support its domineering objectives. Despite what some may say or hope, while Barack Obama is a political, lower-case, lord, he is not the USA’s nor Iran’s savior. This entry was posted on Monday, November 26th, 2012 at 1:43 pm	and is filed under Doctrine, Prophecy. Iran expects sanctions to be lifted in days and then an ‘economic revival’: what about terrorism? Obama Administration Picks Muslim Brotherhood in Syria?